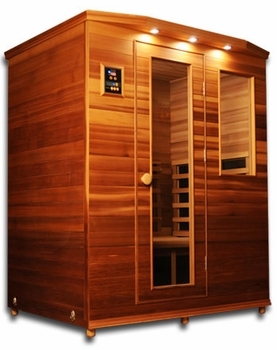 Three person cedar infrared sauna comes with ceramic heaters and dual digital controllers. Perfect for small spaces. Our three person infrared sauna is one of the most popular models and made from highest quality western red Canadian cedar wood and advanced heater is made with a combination of carbon and ceramic elements. This sauna can easily accommodate up-to three persons. Perfect for small spaces like bedroom and basement. 61" Wide x 44" Deep, and 76" Height.